Dimensions 1.23 by 6 by 9 in. 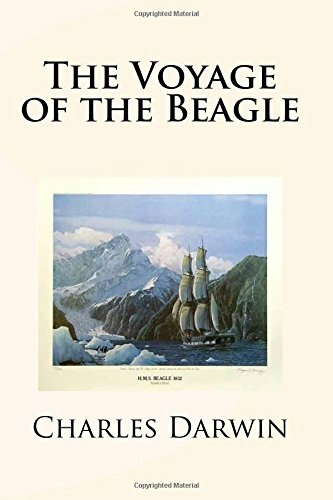 Amazon.com description: Product Description: The voyage of the Beagle (1831-1836) was one of the most important scientific expeditions in history. On board was the young naturalist Charles Darwin. His investigations would change science and the world forever. There was no sudden discovery on the Galapagos sparked by the finches as popular legend has it. Instead he intensively studied the geology, animals, plants and peoples of the lands visited. Along the way he made a number of striking discoveries, particularly in South America, which eventually led him to realize that living things must evolve over time. After his return home he formulated what he called "natural selection" to explain how living things adapt to a changing world. When he published his revolutionary On the Origin of Species in 1859, he began with the famous opening line "When on board H.M.S. 'Beagle,' as naturalist, I was much struck with certain facts." As a research vessel HMS Beagle may not have had the internet, but she did have an impressive state-of-the-art library of about 400 volumes. The library was housed in book cases in the poop cabin at the stern of the ship, which was also Darwin's cabin. Thus, Darwin lived and worked in the Beagle library for five years.